U.S. President Barack Obama holds a bilateral meeting with Ethiopia’s Prime Minister Hailemariam Desalegn in New York. 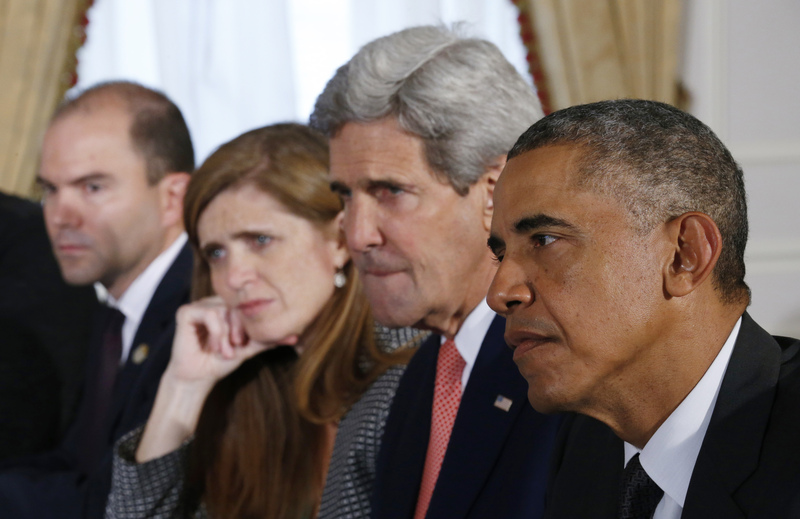 With Obama from left are Deputy National Security Adviser Ben Rhodes, U.S. Ambassador to the U.N. Samantha Power and Secretary of State John Kerry. Besides granting a record number of pardons to non-violent felons convicted of drug offenses, Barack Obama didn’t accomplish very much during his last days in office. That’s not unusual for a lame duck president, particularly when the opposing party is in control of both houses of Congress. Remember how the Republicans refused to allow Obama to fill Justice Antonin Scalia’s seat on the Supreme Court, even though he still had another 11 months to go in his second term? Well, that was par for the course in 2016, a year marked by GOP obstruction of the White House agenda at every turn, including its only override of a presidential veto. Consequently, all the Obama administration’s highlights, from saving the economy, to passing the Affordable Care Act, to the gay marriage initiative, came prior to 2016. That didn’t discourage director Greg Barker from making “The Final Year.” After all, he had been afforded unusual access at that time to President Obama and such confidantes as Secretary of State John Kerry, National Security Advisor Susan Rice and U.S. Ambassador to the United Nations Samantha Power. The film focuses mostly on foreign policy issues, although not much of consequence or of interest was captured while the camera was on. to be honest, what I found most memorable was learning that you can hear rats scurrying around in the White House ceiling in the middle of the night. And that the place has roaches, too! Who knew? Overall, an unremarkable “fly on the wall,” or should I say, “roach on the wall” documentary strictly for political junkies and Obama fans who might miss the man.